I'm getting to the point where I've been around long enough that I have seen a lot of different practices come and go at my golf club. 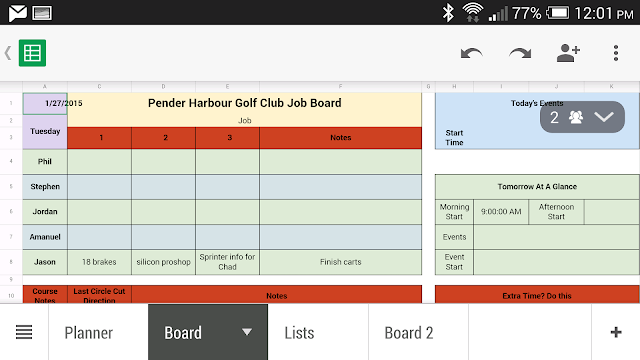 In the 10 years I have been a superintendent here at Pender Harbour we have made a lot of changes for the better. We all know that each course is unique and no one solution fits all situations. Here I will share some of those things that I used to do but no longer do and why. Maybe I will inspire you to ask yourself if these practices are right for your course. When I evaluate a practice I like to ask myself what is it accomplishing and can I accomplish the same thing for less money or in a way that will help me achieve my goals of reducing pesticides and disease pressure. The purpose of verticutting is to remove surface organic matter. Verticutters can remove a lot more organic matter than traditional aeration practices except they cannot go very deep. This is OK because most of the organic matter in a green is right near the surface. Can be used to true-up putting surfaces when setup similar to turf groomers. Only remove surface organic matter and still require regular core aeration to remove organic matter deeper down in the root zone. Often require supplemental nitrogen applications to speed recovery. This kind of negates the benefits of the organic matter removal doesn't it? Remove it, then grow it back in quickly? A short term solution in my opinion. Verticutters are incredibly hard on the grass. They injure the plant and can spread disease. Don't believe me? Check out the following picture following verticutting a few years back. Disease spread from verticutters is a sure way to turn 1 spot of disease into 1000. So I ask myself; Can I accomplish the goals of verticutting without the negative impacts this cultural practice has? The answer is yes. When it comes to organic matter we can either remove it mechanically, or limit its production and dilute it with regular light sand topdressings. I have also noticed that by using the growth potential formula to better time my fertilizer applications I have been able to match growth rates to the natural cycles of my grass. I think the advantages to this might be that organic matter production more closely matches organic matter decomposition. I used to apply lots of nitrogen in the spring and fall when soil temps were low and organic matter would simply accumulate. Of course this is all from my simple observations and I have no scientific proof that this is actually happening. What I can say is that I don't miss verticutting at all and my greens have never been firmer or drained better. 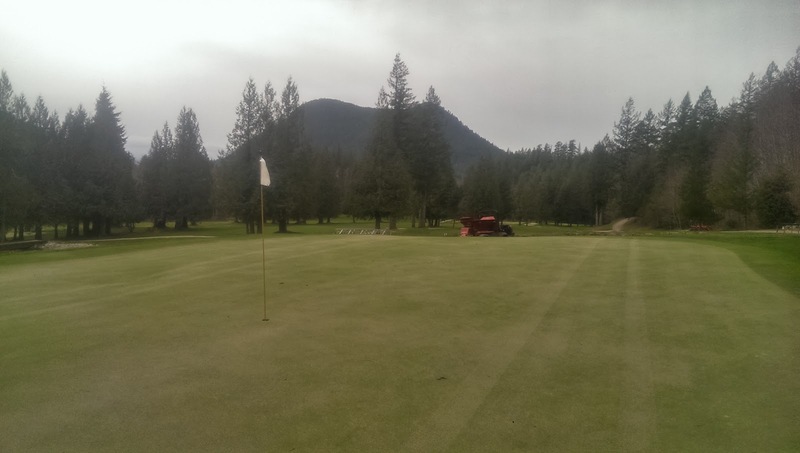 Verticutting can also be used to true up the putting surface and even speed them up. I have found that I can roll once or twice daily to accomplish this goal without the detrimental plant health impacts of verticutting. Rolling also helps reduce disease such as dollar spot where verticutting only spreads them around making them worse. When I think of my disease management success over the years, I can confidently say that it is due in part to my not verticutting my greens anymore. Before I got my lightweight roller I had to mow daily. Daily mowing was the easiest and best way to provide consistent greens conditions day to day. Then I got a lightweight roller and things changed. I heard how guys down in California were rolling daily and cutting every other day. I decided to check it out and even did a few tests to see for myself. Since then I have been hooked on daily rolling and now only mow as required based on clipping yield. In 2013 I got a whole new fleet of equipment. 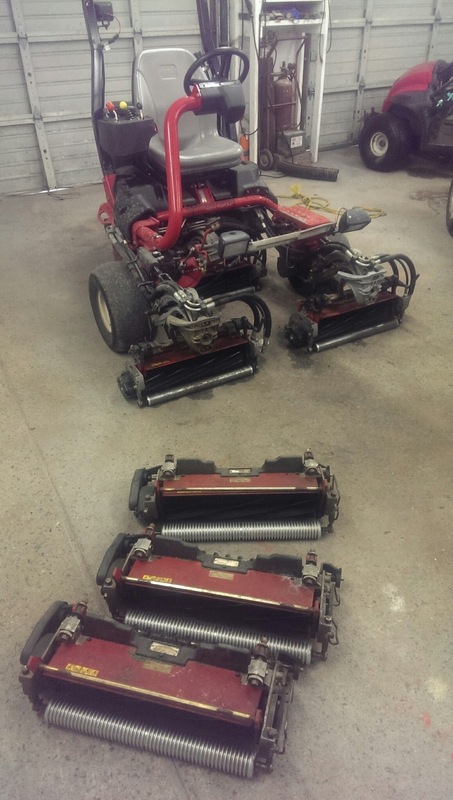 As I was hardly using my greens mower anymore I was able to get 2 sets of cutting units for my only triplex mower. I was now able to save a huge amount of money that would otherwise be needed for more mowers on my course. Also, how many low budget 9 hole courses cut their tees with a triflex? The reduced mowing has also helped me reduce disease on greens and my entire course in the winter time. When combined with primo maxx applications I have gone 107 days without mowing on my greens and had the easiest time in my career managing fusarium on my course. You might even be convinced I applied a fungicide on my fairways and tees but nope, I didn't. They are miraculously disease free! Maybe it's just dumb luck but for someone who tries as hard as me it's an odd coincidence that's for sure! Last year I read this excellent article on Turfnet. It makes a case for how workaholic superintendents are job-vulnerable. It made a lot of sense to me and changed my attitude towards my job. It helped me reorganize my life and work priorities and the result has been that I am now better at both. I also put together a really good job board which has helped me be more productive with my time and my staff's time. If you think electronic job boards are only for the high budget courses think again. The return on investments for my $500 job board was a few weeks at most. Low budget courses cannot afford to have unproductive staff. Organizing and prioritizing all the jobs for your staff up to two weeks ahead of time will get the most out of your limited workforce. The first few years I was a superintendent I syringed greens during the mid day in an attempt to cool them down. My "weak" poa annua couldn't handle the "extreme" summer temperatures. This all changed when I got a infrared thermometer. This device allowed me to easily monitor surface temperatures. I would see a slight decrease in temps following a syringe but the temp would quickly return to normal within a few minutes following the light water application. If this practice was to make any impact on the plant surface temperature I would have to water almost every few minutes! Obviously this isn't something that is feasible on a golf course. Furthermore have you every applied too much water to a green during extreme heat? Well I have! Although it wasn't me to applied the water that killed the green below I was the superintendent at the time so obviously some of the blame falls on me even though I was away. Yeah, sure, that water application was hardly a syringe but I have still noticed damage caused by adding water to greens during periods of extreme heat even if it's only on the leaf surface and not watering the soil. Long before I was a blogger and had a camera to take pics I noticed that the last greens that we would water, and greens that were syringed had brown patch in the summer. The surface moisture and daytime heat provided the perfect conditions for fungal pathogens to go crazy. Since then I try not to apply any water to my greens after 10 am. If they aren't watered by then, I wait until the following night. I wrote about this on an earlier post about how I changed the timing of my greens irrigation with great success. I have yet to see poa annua die from having too little water in one day. 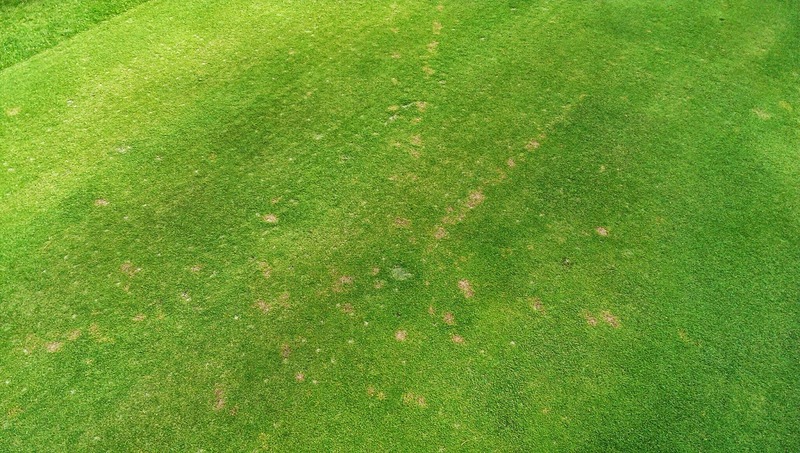 It takes days and days for poa to die from lack of water. If it is hot enough to kill poa and it hasn't been adequately watered in a few days you have bigger issues. 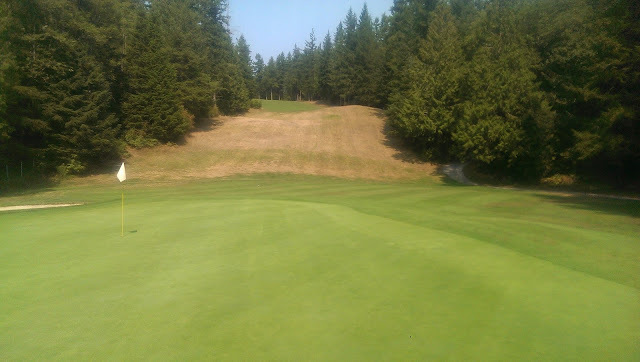 Last summer was the hardest summer probably ever to grow poa on the west coast. We had no rain and temperatures regularly in the mid 30's. The highest temp we saw on my course was 37C and guess what? We didn't lose a single blade of grass on the greens and we didn't syringe or add any water for cooling. If you are serious about reducing pesticides on your greens in the summer, stop creating the perfect conditions for fungi when it's not needed. Wet and warm is not a good combo. I used to use pigments and now I don't. The benefits of pigments are many but for me those benefits just aren't worth it. If I can accomplish my goals without pigments why add them to my "program" when they consequently take away one of my most powerful turfgrass management tools? I consider my eyes to be my most powerful turf management tool. Combine the experience I've gathered over the past 15 years with the ability to look at the grass and make an assessment of how it is doing and you can consistently make the right decision for what to do next. If you take away your ability to observe what the plant actually looks like you take away your ability to make sound management decisions. With the pigment cover up you can get caught with your pants down when it is now too late to take preventative action. This can lead to the need for additional pesticide applications or less than ideal turfgrass conditions. I've had a few scares with pigments over the years so now no longer use them and I haven't missed them for 1 second. Yes, they do have some benefits, but no, I don't think I'm narrow minded to find that they are an unnecessary and potentially dangerous product to use. I also don't use dyes when I spray fertilizer anymore either. With high volume air induction nozzles you can get good coverage without the fear of plugged nozzles. I don't have filters of any kind in my sprayer and never have plugged nozzles anymore. I use my sprayer 2 times a week on average. So there you go, I've stopped doing a lot of things on my course, have saved some money, reduced inputs, and likely saved my sanity. One day I'll do another one of these as there are a lot more things that I no longer do on my course. It has gone so far that you might consider me a "do nothing" superintendent and you wouldn't be too far off. Remember that old saying "less is more," I have found that it is definitely true although with the myriad of band aide products easily available, it is easy to get caught up in the vicious circle of chasing our tails in a never ending struggle to find that balance.